After our math chapter on data collection, my students have worked with using tables and tried creating a few. 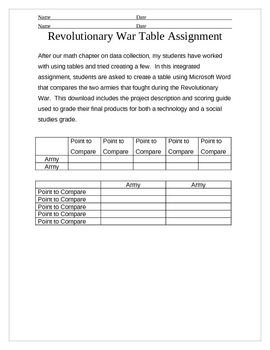 In this integrated assignment, students are asked to create a table using Microsoft Word that compares the two armies that fought during the Revolutionary War. This download includes the project description and scoring guide used to grade their final products for both a technology and a social studies grade.